DVD Synopsis: Stand and pledge loyalty – or prepare to lie cold beneath your shields. Chivalrous knight Wilfrid of Ivanhoe is determined to restore Richard the Lionhearted to England's throne. Gallantry and costumed pageantry combine in this crowd-pleasing nominee for 3 Academy Awards including Best Picture. Robert Taylor plays the title role and Elizabeth Taylor and Joan Fontaine also star in a rousing adaptation of Sir Walter Scott's novel. Written by Sir Walter Scott in 1819, Ivanhoe is widely regarded as a literary classic, and while no film could possibly encompass the multitude of events that Scott presented in telling his tale of chivalry in Medieval England, Richard Thorpe's 1952 film proves, at the very least, an amusing take on the story. 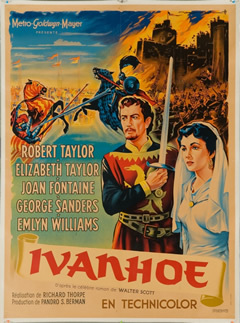 Starring Robert Taylor (an American who, quite wisely, doesn't even attempt a British accent), Ivanhoe is a veritable feast for the eyes. For starters, it's a very pretty film to look at, with vibrantly colored costumes set against the scenic English countryside (not to mention the fact that it co-stars Elizabeth Taylor, who, in 1952, was at the height of her beauty). In unison with the splendor, there's plenty of excitement as well, such as the jousting tournament, where Ivanhoe takes on five of King John's best knights, and the lengthy siege of Torquilstone Castle, with it's rapid cuts and non-stop action, is a positively thrilling segment. Crisply directed and excellently paced, I believe Richard Thorpe's Ivanhoe is a film that even the most ardent purists of Scott's classic novel would find entertaining.